Most good breweries will tell you that great beer starts with the finest ingredients. 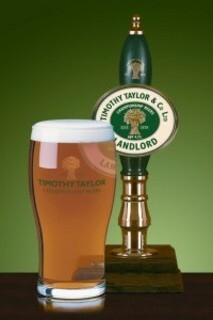 Timothy Taylor is one such brewery and maintains a very Yorkshire sounding principle of “not accepting second best”. Their Knowle Spring brewery sits on a natural artesian well, which provides them with a constant supply of pure Pennine spring water; water that has been filtered through layers of limestone and is naturally soft and very pure. If you chose to drink it in its pure form, it is said to taste like melted snow. Their unique strain of yeast, called appropriately but not surprisingly Taylor’s Taste, is over 1800 generations old. It was chosen to combine perfectly with their water and barley. Timothy Taylor is one of the last brewers in Britain to still use whole leaf hops. These hops may cost more, may be harder to store and take more looking after, but Timothy Taylor believes they’re vital to the flavour of their beer. However, it is when it comes to the barley that the brand’s commitment really shows. Not only do they exclusively use Golden Promise barley, which is the most expensive barley you can use for brewing beer – it’s the barley used in many malt whiskies – but they are notoriously picky about the batches of the barley they choose. So who is it that scrutinises the barley? No, someone even more picky than that. The quality assurance experts are none other than the pigeons of Yorkshire. In 1966, Allan Hey was appointed head brewer and he introduced a new quality test for the barley. He would count out exactly 100 grains of barley malt and set them out on a cask that he then left in the brewery yard. He would later return to see how many grains were left. Too many left meant the batch would be declined, only a few remaining and the barley would be used. Allen retired and his pigeon test with him but the use of Golden Promise barley remains and it is now grown specially and specifically to a set of exacting Timothy Taylor standards, ensuring that every pint is clean and crisp and has the necessary fullness and roundness of flavour. So the next time you have a pint, have the one the pigeon is having! Heineken’s famous “Refreshes the parts other beers cannot reach” campaign scores on all three counts. The myth runs that one of the best beer advertising campaigns was created by a creative team who, without an idea in their heads fled the country with a one-word brief and the threat of being firing if they didn’t come back with a campaign. 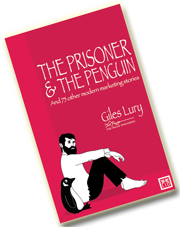 The second half of the myth is that the campaign was nearly killed by initial negative research but only saved by a client who chose to ignore the findings. It was the early 1970s, a period when bitter dominated the UK beer market but lager was starting to grow rapidly, and copywriter, Terry Lovelock and art director, Vernon Howe from the agency CDP were given the brief to creating a TV campaign for Dutch lager Heineken. Their brief was just one word – Refreshment. They were struggling and hadn’t come up with anything any good. They decided to try new surroundings and decided to head for Marrakesh. On their way out, they met Frank Lowe the head of the agency who told them to make sure they came back with a campaign or not to come back at all. Frank Lowe loved the idea and presented it to the key client, Anthony Simonds-Gooding while the pair were on a flight to St Petersburg. He had written it on a sick bag. Simmonds-Gooding loved the idea too despite the presentation material. Despite this, according to the myth, the ads however nearly didn’t run. The research was extremely damning. Had Anthony Simonds-Gooding, then the Whitbread marketing director, chosen not to follow his instincts after seeing poor feedback from the first three ‘refreshes the parts’ TV spots, the campaign would have been stillborn. But Simonds-Gooding pressed on. 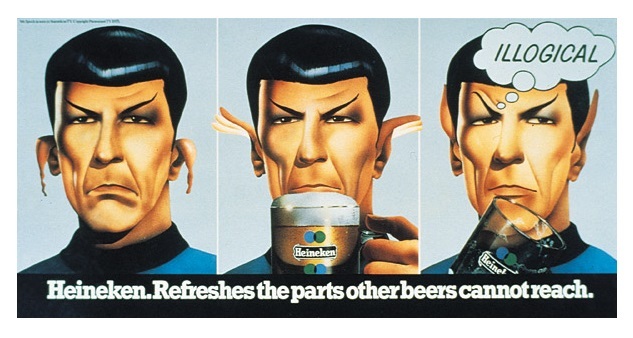 The ads however did indeed run and the campaign was to stretch over the next two decades, including famous ads like Policeman, Spock’s ears and Majorca. 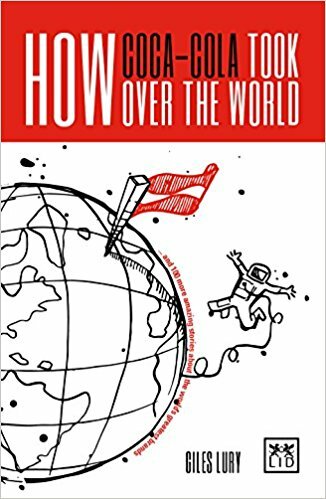 Like many myths there is a great deal of truth in this tale, but some parts have perhaps been distorted or exaggerated for effect over the years, so following a little research of my own I thought I would point out a few points of contention. It is true that Terry Lovelock and Vernon Howe of CDP had indeed been given the brief to create a new campaign for Heineken. However while the key word they were asked to focus on was “Refreshment” – this was part of an overall creative brief which contained background, target audience and desired tone of voice. However, like many briefs of the time it was reduced to a single thought or word as shorthand summary of the requirements. They idea that they were only given a single word adds to the drama but not the truth. The notion that they just decided to try a new location and just head off to Marrakesh fits with ideas of the glamorous and free-spending nature of the advertising world in the 1970s. However, the real reason they left for Marrakesh was for a photographic shoot for Ford. Without the need for the shoot, the new locations would probably have been the local pub. It seems plausible that Frank Lowe would have said to them to come back with something or don’t come back at all – whether he actually meant it was another thing. Vernon Howe would have been focused on the shoot, so it’s not too surprising that Terry Lovelock “walked around Morocco” as recalled in the passage form ‘Inside CDP’. The next area of controversy is the research and those negative findings. As we have seen, the Heineken campaign has long been held up as an example of the tension between creativity and research and used to highlight the danger of research. Perhaps one of the most interesting points to come to light is that the research everyone refers to took place in April 1974. What’s so interesting about that is that the campaign first appeared in March 1974 – so the research didn’t stop its running. What that research said, once it had been conducted, contained both negative and positive elements. There were negative comments about the specific executions – ‘what’s beer got to do with ears?’ (Piano Tuner) and ‘not the sort of thing you’d like to see when you’re eating your tea’ (Policemen) and some respondents failed to get the connection between the beer’s restorative powers and refreshment – ‘beer’s supposed to refresh you, they say it’s a medicine’. However more positively the report also said that the advertising was on strategy, and endorsed the need to focus on refreshment as a point of difference and raison d’etre for lager and for this brand. So like most good research it provided information and interpretation, which the client could then make a judgement call on and that’s exactly what Anthony Simonds-Gooding did. When Australian lagers arrived in the UK in the 80s, Heineken decided it needed to reinforce its European credentials and hired comedian Victor Borge for the voiceovers. This was an interesting choice, since Heineken is Dutch and Borge was Danish, so there is probably another tale to be told. What the Heck! When you have to compete with yourself. 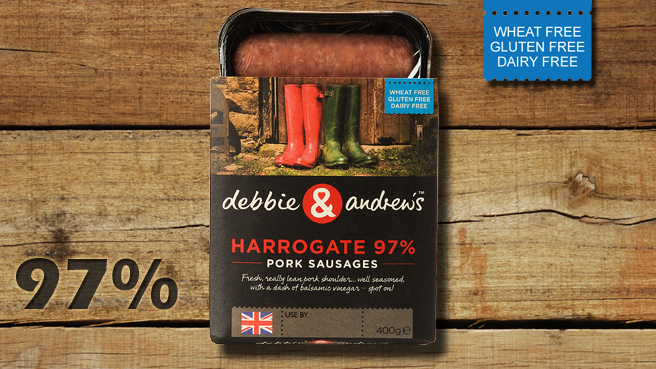 In 1999, Debbie and Andrew Keeble set up what was not the most originally named premium sausage brand. Nonetheless, “debbie and andrew’s” was to prove a success. Both Debbie and Andrew came from farming backgrounds. Debbie had studied at agricultural college before working on the family farm as the pig manager. Andrew was a hill farmer. They met through the industry, married and farmed together. One day Debbie realised her family would need more than farming could provide. Whilst hard work the brand grew and proved to be a success but when a buyer came knocking in 2005, they decided it was time to hand over their majority stake, as the buyers JJ Tranfield said they could help the brand grow much faster. Debbie and Andrew stayed on as managing directors. Initially things went well but Tranfield was taken over by Dutch food giant Vion. This second set of new owners started to change things. “The quality changed, the packaging changed and they didn’t really know we existed,” Debbie recalls. “We thought, we’ve got this money, do we put it into a savings account, or do we gamble it all?” says Debbie. The new brand, Heck, is named after the Keeble family motto, “What the heck!” and because it sums up their ‘no compromise’ approach to quality. The brand is still very much in the premium sausage market but is aimed at a slightly younger target audience. It competes with brands like The Black Farmer but also their old brand – debbie & andrew’s. “We’re sharing the shelf in the supermarkets with the brand that we put so much effort into,” said Debbie. Heck! did well, with turnover of £3.5m in their first full year of trading and today, Heck’s produce is stocked by Waitrose, Tesco and Morrisons. This time Debbie and Andrew will not be selling out. “The plan is to keep it in the family and to keep control,” insists Debbie. Sometimes you can get too close to something, where you can’t see the wood from the trees, or in this case the chocolate for the beans. The insight that helped transform Green & Black’s into a real contender came not from the original founders but from a later investor and their own customers. Curiosity peaked, Craig made up a small bar of 70% dark chocolate. He tried a bit and left the rest of the bar on his desk. A little while later his wife Josephine walked past the desk saw the chocolate and decided to try some. She loved it. She had never tasted anything quite like it. The couple decided they had another potential hit on the hands. Looking for a name, they thought back to their childhood and some of the famous confectionary brands of the time. Brands like Callard & Bowser and Barker & Dobson. They came up with Green & Black’s, two names that reflected the organic origins and the intensity of the dark chocolate. A few months later Craig & Jo took a holiday to Belize. It was there that they learnt about the plight of a group of Mayan farmers who had planted cocoa trees on the understanding that their crop would be bought by a large chocolate company. 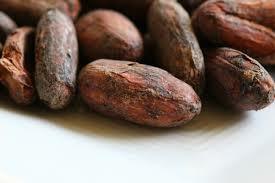 The chocolate company had however pulled out of Belize leaving the farmer without a buyer for their beans. Craig and Jo decided to help out, and agreed not only to buy the crop but also to pay a full and fair price for it. They used the crop to create a product based on a traditional Mayan chocolate and spice drink using orange, cinnamon and hint of vanilla. Mayan Gold was to become a star product and it became the first-ever chocolate bar to be awarded the Fairtrade Mark by the Fairtrade Foundation UK. Despite so much going to for it, the business failed to accelerate away and by 1998, it was struggling and was heading into financial difficulties. It was at this point that William Kendall and his business partner Nick Beart stepped in. Kendall had been a farmer but had turned entrepreneur when he help turn around the New Covent Garden Soup Company. He had helped sell the company for £20 million in 1997 and decided to invest in Green & Black’s. With the new insight driving a new refocused marketing approach, bars flew off shelves.